Hi guys! So I have been sewing up a storm lately, getting all sorts of little dolly gifts ready for Christmas. 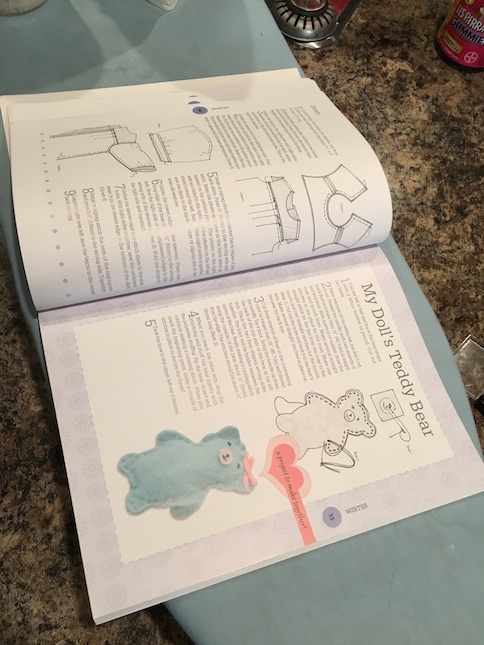 Recently, I purchased a sewing book for doll clothes that I decided that I should really do a review on for anyone who is into sewing things for their dolls. 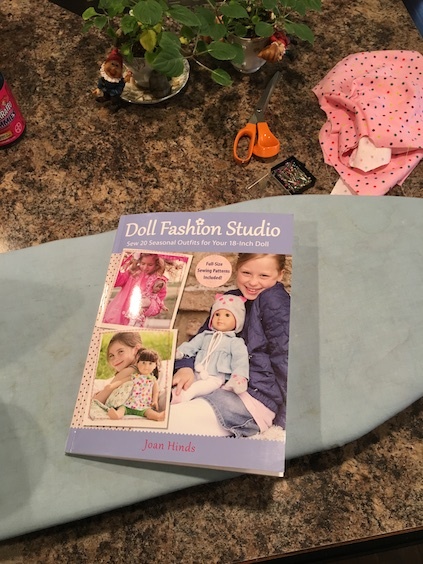 I purchased Doll Fashion Studio by Joan Hinds on Amazon for $20 CDN. I also purchased a few other Christmas goodies, so I was able to take advantage of the free shipping. 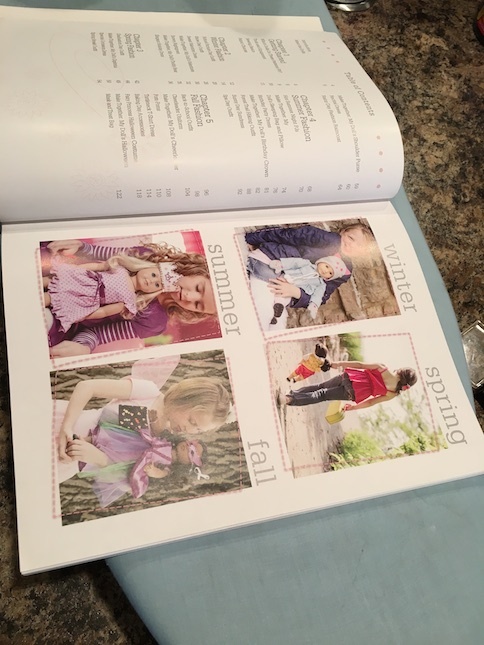 I was excited to get this book because it comes with the instructions to make 20 seasonal outfits for the dolls! That’s about a dollar per outfit pattern, which I thought was a lot of bang for my buck, since doll clothing patterns can often run for upwards of $5-$8 each. When the book arrived, I was excited to begin. The first thing that I noticed was that the book came with full sized patterns. That was a huge plus for me! All I had to do was cut the pattern pieces out, right? Wrong! The patterns come on three of these large sheets of paper. Where I thought that I could just cut them out easily, upon further inspection, (and before I started cutting, thank heavens! ), I discovered that the pattern sheets were double sided! I couldn’t cut out the patterns on the one side, because that would just cut up all of the pattern pieces on the other side! What to do? I decided that I would try scanning the pieces that I needed, and printing them off on my computer. A couple of minutes later, and very frustrated with trying to fit huge pattern sheets in my small scanner, I realized that the scanner was shrinking the images a little to fit them on the pages. Since the pattern pieces are meant to be full size, that wouldn’t work at all!! Back to the drawing board for me. Next, I thought that maybe our neighbourhood Staples store would just copy the pattern pages for me for a small fee. I phoned them. They said that for a copy of that size, they would have to send it out, and that could take days. In hindsight, and this is what I recommend you do, if you do purchase this book, take it to your local copying centre, and just copy the pieces that you want on their photocopier. I think ours is 10 cents a copy. By then however, it was late at night for me, so I just ended up tracing out the pattern pieces that I needed onto paper. 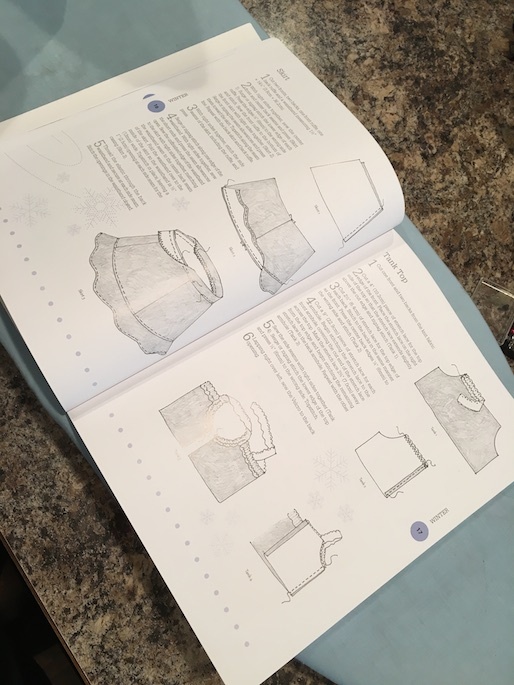 The second thing that I noticed about the pattern pieces was that there were no grain lines indicated, and no fabric layouts in the book to help a girl out. Grain lines are important because they help garments stretch around, and over the body’s parts in the proper way. You can find the grain line in your fabric by tugging on it. Being that I’m a more seasoned sewist, (I don’t know if that’s a proper term, but I like it better than sewer), not entirely professional, but more skilled than a beginner anyway, I could easily sketch the grain lines in where they should go. However, I don’t think that a beginner would know this, and it proves crucial. I know because I sewed a pair of doll pants from this book, and having neglected to acknowledge the grain line, the finished pants would not stretch enough to fit the doll at all. They ended up completely unusable, which I am sure that I would have found with the other patterns in this book had I not gone in, and penciled in the grain. Then and there, I decided that this book is probably not meant for beginners, and that’s okay. I’m not a beginner anyway! Here is a bit of a look inside the book. The whole idea is that you can create outfits for your dolls for each of the four seasons. I think the book is right on target with this idea! There is a wide array of different outfits to choose from, rather than all summer dresses, or everything sleeveless. I appreciate this because I have a lot of other patterns already, but this book offers a wide variety of patterns that I don’t have. 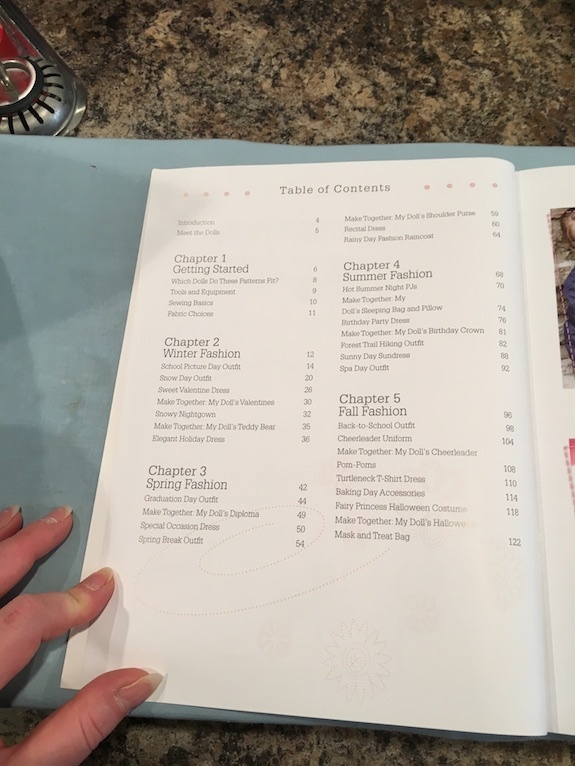 This is the Table of Contents. For a closer look, just click the link above as Amazon allows you to browse through the front pages of the book a little. There are five chapters. The first chapter is a definite must read as it explains all of the tips and tricks you need to get started sewing. The other four chapters give instructions on how to make the outfits for each season as well as 8 bonus crafts for you to make. Here is an example of one of the bonus crafts. Patterns for the crafts are provided in with the other pattern pieces. One thing that I have to give this book credit for is the ease of finding the pattern pieces. They managed to fit all of the pattern pieces for each outfit in the same area on the pattern sheets. This makes it very easy to find all of the pieces you need, and it makes photocopying easier as well. The instruction portion of the book comes with illustrations. The illustrations are not too bad. I would have preferred colour photos, but I know that would have driven up the price of the book. Besides, the illustrations are fairly easy to understand. #1. I’m not a huge fan of the actual instructions in this book. I mean, don’t get me wrong, I’m not saying that they are impossible to follow, one must just read them very carefully. I found that there was a lot going on in just one of the steps that you see above. So much so, that I would have broken it up into two or three, or even five steps! Of course, that would mean more pages, more cost etc. #2. We’re making doll clothes, clothes that just get tossed on the heap, so why all the unnecessary stuff? I’ve found that when working with this book there are a lot of details worked in that quite frankly aren’t needed. Don’t get me wrong, I like pleats as much as the next guy, but these are play clothes. The dolls don’t care, my kid doesn’t care, why do I have to take an extra ten minutes pinning pleats into the skirt of a doll nightgown, or tacking binding on its sleeves? I also don’t think that the dolls need separate waistband casings stitched onto their pants/skirts. Just fold the top down, stitch it closed, thread an elastic through and you’re done. Easy peasy. I have to say, some of the details are cute, like the kitty face on the toque, or the ruffle on the holiday dress sleeve, but I would rather save my time up for that instead. #3. Okay, my worst pet peeve. So you gather up your carefully cut out fabric pieces, and you are ready to sew. You are excited to begin! Then you read the first step. 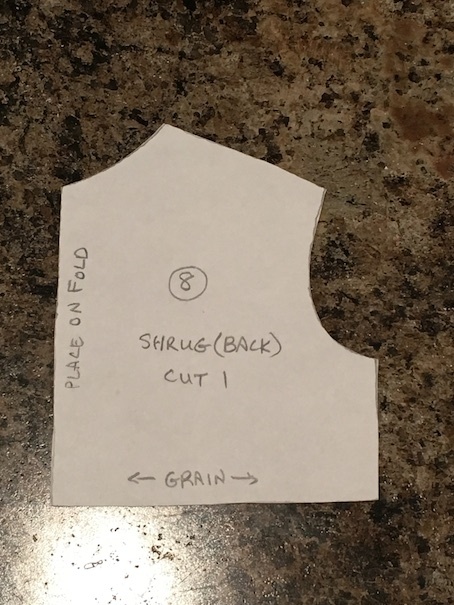 Step One – Cut out five other extra pattern pieces that you have to measure by hand, because they are of the rectangular shape, so we just figured that you might as well do that part yourself. Arrrghhh! I hate this! I hate this so much. Now, I know, I know, pages and cost, and more pages and more cost, but there isn’t anything more frustrating and annoying than cutting out all of your fabric pieces, and going to start sewing to find out that, oh gee, now you have to also cut out this length of fabric for the skirt, and that length of fabric for the binding, and this other length of fabric for the bias strip, and a ruffle etc. So yeah, be prepared for a lot of that. Okay. Shake it off. LOL! All of that aside, I am having a lot of fun sewing with this book. So if you are a seasoned sewist, and you enjoy sewing doll clothes, then this is probably a good match for you. Despite the cons, (I was able to avoid a lot of frustration just by reading ahead), the actual designs in the book are quite good. The sewing methods are pretty simple too. 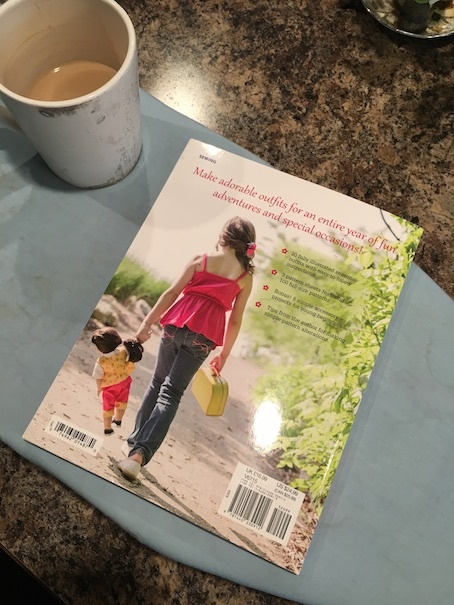 The book is also featured in a two part YouTube series on Sewing With Nancy. Stay tuned as I will be giving an update soon on everything that I’m making with the patterns in this book! I hope you enjoyed! Do you like to sew for your dolls? < Previous WE ARE BACK! Since I am older than dirt and predate easy access to copy machines. I am talking purple master worksheets on a hand cranked machine. I also used to smock and sew for the public. Many heirloom patterns came like the patterns in the book. If you cannot get to the copy store. Tape your sheet to the largest window you have. Now you can trace your pattern pieces. Using freezer paper allows you to tape it to the window without tapeing it to you pattern sheet. I have this book and have made many of the patterns. It is a great book. It is a good book! I have made a few of the patterns now, and I am happy with them. Some of it is tricky, and it takes a few minutes to figure out, but if you have the patience, you can get some really great results. I definitely don’t feel that these are easy patterns for beginners, being that some of the instructions you have to work out for yourself, and the grain lines are missing. I have some very simple patterns that I prefer as a go to, especially if I want to make larger quantities of doll clothing for gifts. But if you are looking for unique patterns with interesting details to try out then these are great! Joan Hind has another book with even simpler patterns called “30 Minute Doll Clothes”. She co-wrote it with Nancy Zieman of “Sewing with Nancy” and was featured on her show. It is the book that got me started making doll clothes. I LOVE this book! our library had it, I checked it out, returned went to check it out again, and they had gotten rid of it!!!!!!!!!!!!!!!! I was NOT Happy! I hadn’t been able to make any of them yet, I was so disappointed. I was quite the little seamstress in high school and sewed many of my outfits, but that book is giving me anxiety. Cutting out is my least favourite part, to sit down ready to sew and to realize that there is even more to cut out would frustrate me to no end! Good for you for sticking with it! I look forward to seeing the finished products! Wow that’s amazing! I never sew outfits for myself. That gives me anxiety just thinking about it! 🙂 I’m left handed. That means that scissors and I don’t really get along very well, but I am also quite determined in general, so we shall see. I’m making everything in threes though, so that doesn’t really help matters! LOL! You are amazing at reviews! That sewing pattern book sounds quite confusing. 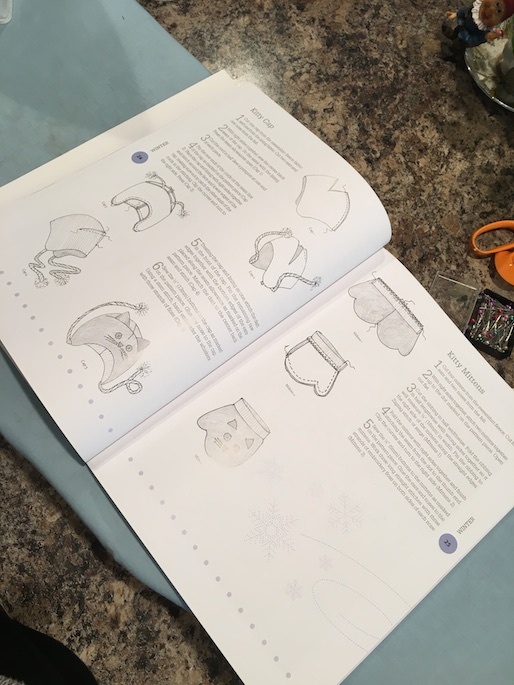 I love sewing, but I’m not the best at following patterns, so I would probably just throw in the towel at the instructions in the book. LOL. Super excited to see what creations you make from it! Very interesting review! 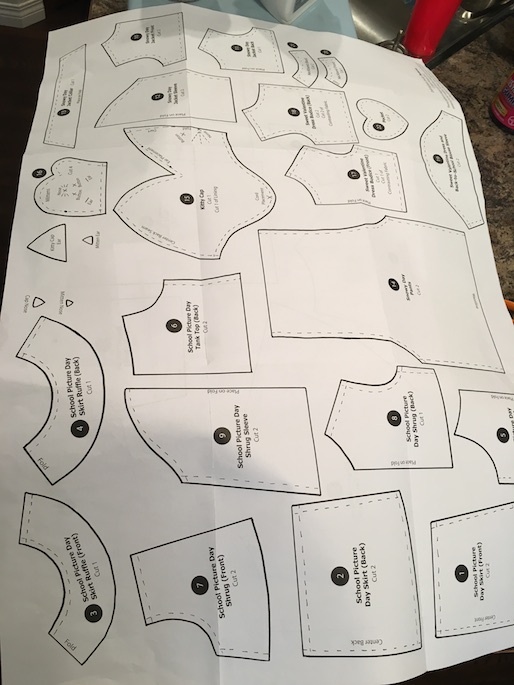 A lot of the things you pointed out are one of the reasons I LOVE Pixie Faire patterns over any others, they are so well done, easy to print and super easy to follow. There is nothing I hate more than cutting something out and then trying to figure out how it’s supposed to go together because of lousy instructions. It’s one of the reasons I haven’t made the tent pattern yet, I’m still trying to figure out the best way to put it together because whoever wrote it was an idiot! I love Pixie Faire patterns as well! The instructions are so amazingly well done. I hope you have better luck with that tent pattern! From reading this post, it seems that doll pattern envelopes(or whatever they’re called) might be the better option! I was appalled when I read that you had to cut out rectangle pattern pieces! That’s terribly annoying. I do like to sew, and I have a lot of doll pattern envelopes. With those kinds of patterns, the pattern pieces don’t have to be copied. Sometimes the instructions can be confusing, though. I have some doll pattern envelopes too, and you’re right, their instructions are a bit confusing. I also don’t like onion paper patterns. They are too fragile. I always rip them! I can never fold them up properly after I’m done using them either. They never fit back into their envelopes, so I just keep them in plastic ziploc baggies. I really do prefer paper patterns, and these were okay, once I got them all cut out that is. I really hated having to measure, and cut the rectangle pieces for sure! Now that they are cut out though, I guess I can just use them every time I use the pattern. The initial process was just time consuming! I prefer ready to cut pattern pieces, but that would have taken up a lot of space on the pattern sheets, so I get that. Photocopying everything was a drag too, but now that all of the prep work is done, I am feeling less frustrated by the whole thing. Now I can just enjoy the sewing part! LOL! 🙂 And I don’t have to do all that work again the next time I go to use the patterns. I can just grab the pattern I want, and get right to it! So that’s a relief!